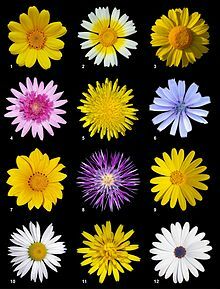 Many plants in the Asteraceae family attract beneficial insects. Beneficial insects (sometimes called beneficial bugs) are any of a number of species of insects that perform valued services like pollination and pest control. The concept of beneficial is subjective and only arises in light of desired outcomes from a human perspective. In farming and agriculture, where the goal is to raise selected crops, insects that hinder the production process are classified as pests, while insects that assist production are considered beneficial. In horticulture and gardening; pest control, habitat integration, and 'natural vitality' aesthetics are the desired outcome with beneficial insects. Encouraging beneficial insects, by providing suitable living conditions, is a pest control strategy, often used in organic farming, organic gardening or integrated pest management. 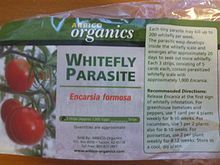 Companies specializing in biological pest control sell many types of beneficial insects, particularly for use in enclosed areas, like greenhouses. Ladybirds are a beneficial insect commonly sold for biological control of aphids. 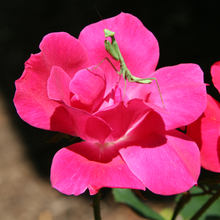 A European mantis hunts for prey on a shrub rose. Encarsia formosa, an endoparasitic wasp, was one of the first biological control agents developed. Some species of bee are beneficial as pollinators, although generally only efficient at pollinating plants from the same area of origin, facilitating propagation and fruit production for many plants. Also, some bees are predatory or parasitic, killing pest insects. 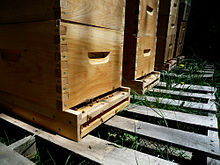 This group includes not only honeybees, but also many other kinds that are more efficient at pollinating. Bees can be attracted by many companion plants, especially bee balm and pineapple sage for honeybees, or Apiaceae like Queen Anne's lace and parsley, for predatory bees. Ladybirds are generally thought of as beneficial because they eat large quantities of aphids, mites and other arthropods that feed on various plants. List of companion plants – a common companion plant's function is the attraction of beneficial insects. ^ "Farmscaping to Enhance Biological Control", ATTRA - National Sustainable Agriculture Information Service. "Phillip Alampi Beneficial Insect Rearing Laboratory". State of New Jersey Department of Agriculture. Retrieved August 2, 2012. "Beneficial insect habitat in an apple orchard: Effects on pests". Research Brief #71. Center for Integrated Agricultural Systems, College of Agricultural and Life Sciences, University of Wisconsin-Madison. September 2004. Retrieved August 2, 2012. "Orchardists Install Beneficial Insect and Pollinator Habit". USDA Natural Resources Conservation Service. Archived from the original on February 21, 2013. Retrieved August 2, 2012.